Have you ever been in one of those reading funks where you feel like you'll never find another good book to read? Yeah, I was in one of those for a while, aimlessly reading, hoping to come across a novel by chance that would hold my attention till the end. I never thought that In The After would be the one to break me out of my book-related depression, but it definitely did the trick! I can't believe I procrastinated waited so long to finally give it a try. What I expected to be bland, humdrum, and uneventful turned out to be fast-paced, thought-provoking, and awe-inspiring. Throughout the span of this book, Amy ages from 14 to 17 years old, which is pretty bizarre for well....any book really. In my opinion, the formatting and structure of this novel was really weird and confusing, but I'll elaborate on that later in my review. For some reason, I started into this expecting Amy to be one of those aggravating damsel in distress types and was pleasantly surprised when I discovered that she wasn't remotely close to one at all. What I really admired about her character was that although she was badass and did anything required for her survival, no matter how embarrassing it was, she acted like any other teenager. When the "aliens" attacked, she broke down, crying herself to sleep every night. This was a pretty understandable and realistic reaction considering the fact that in her mind, she could've very well been the last human alive, stripped of everything that was normal or constant in her life. One second she's complaining about school or hanging out with friends, and in the next, she's isolated in a world that's no longer her own, scavenging for items like food or clothes that she took for granted in the Before. However, after she fully grasped the concept that the apocalypse was really happening, she pulled herself together and forced herself to remain strong, not allowing herself a moment to dwell on her hopelessness. She learned to adapt to her surroundings and make the best of what she had, which I really admired about her. She chose to keep fighting when many others would've just given up. Throughout the whole novel, she utilized her exceptional intelligence, honed her intuition, made sure she learned how to properly defend herself, fought for what she believed was right, and retained her take-charge attitude, not allowing things to pass her by when she was able to do something about it. 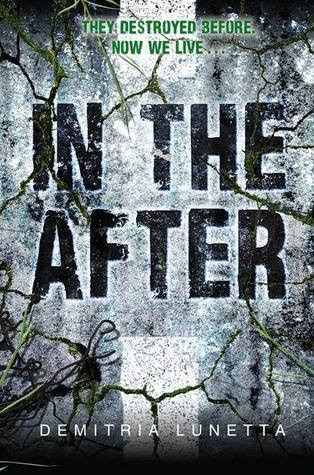 In The After was fast paced and action packed. Although the plot was nothing I haven't seen before (corrupt governments, forced pregnancies, inventions gone wrong affair), Demitria revealed it in a way that captured my attention and never let go. I was expecting to fit in a couple of chapters here and there, but after getting through the first two chapters, I knew, without a doubt, that that wasn't going to be happening anytime soon. I finished In The After in one sitting, oblivious to how much time had passed, because I was just that emotionally invested in the plot and the characters revolving around it. The only reason that I didn't give this epic novel a five star, or even six star, rating was because I wasn't a huge fan of the way Demitria structured it. Don't get me wrong, she strung sentences together and made them flow smoothly and evenly like a pro, I just didn't like the way she switched back and forth between the past and the present. It was bearable for the first half of the story. Although annoying, I learned to live with it and move on. But the second half? It just irritated me, and no matter how hard I tried to get used to the flow of it, I wasn't able to adapt with the constant change in time frames. I understand what the author was trying to accomplish, but sadly, it didn't work out very well, at least for me. The romance in this one was surprising as well. Unlike most YA novels, this story focused on the plot instead of the romance, which I was extremely grateful for. The relationship between Amy and said love interest was important and affected how everything went down in the end, probably even more crucial to the overall story for the sequel, but it was on the side. Another thing that kept this novel apart from your average Dystopian novel was that instead of your typical broody, dark soldier love interest with a twisted past, we have a geeky and slightly awkward teen scientist who has mysterious secrets of his own. Dang! Amy sounds like my kind of character! And I love geeky love interests;) Great review as always! Love this review! I too was kind of meh about the summary of this book. The name "Baby" just doesn't sound right at all. Still, having such a strong female protagonist like Amy is definitely a plus! Must read this book now!! You'll see why she's named Baby once you read the book. Although it wasn't too great of a reason, I thought it fit once I heard the explanation. Yeah, I was iffy on reading this one as well, but decided to pick it up as an impulse read. I really do with they came up with a better synopsis, it doesn't do the book justice. I feel the same way, Daniela! If "geeky love interest" is a trend to watch out for, I'm stoked! I'm so not into those dark, brooding, tortured souls (although "Angel," from Buffy will always be the exception). I'm ready for some self-aware humor & brains! Nice review! I just got this book and your review is inspirational for me to get reading!